You’ve probably seen those little bendable apparatuses as you’ve walked through the hair section of the drugstore and wondered how they could possibly be incorporated into your hair styling routine. Ultimately you left them on the shelves, intimidated by how to use them. However, there is nothing to be intimidated about -- and you’ll find that after reading this hair how-to, you’ll have an affinity for the brightly-colored little hair do-dads. For this tutorial, you will need a few packs of flexi-rods (can be the same size, or you can use different sizes for a more carefree look), a few claw clips, a comb and a spritz bottle or gel (depending on your hair’s texture). First, begin by thoroughly combing through the hair and separating it into four sections. Clip each area out of the way for easier application of the flexi-rods. Next, choose a section and apply either a spritz of water or gel. Be careful not to use too much product or you will regret it later! After the section has been misted or a small dab of gel has been thoroughly distributed to that section, take a small portion of that section (it doesn’t have to be parted), grab a flexi-rod, and beginning at the end of that grouping of hair, roll upward until the scalp is reached. Bend both ends, one going towars the scalp, and the other away from it. This should secure the flexi-rod in place by making a cocoon-like shape around that section of hair. Continue doing this for all the hair in each section, until the entire head is complete. I would suggest doing this particular style in the early morning so it will be dry by night time for evening outing. Or, do it at nighttime so that it’ll be dry by morning -- the end result is worth the one night of sleeping on folded hands. After the hair has had time to dry, remove the rods carefully and separate the lovely curls. You can keep them as neat or as messy as you like. 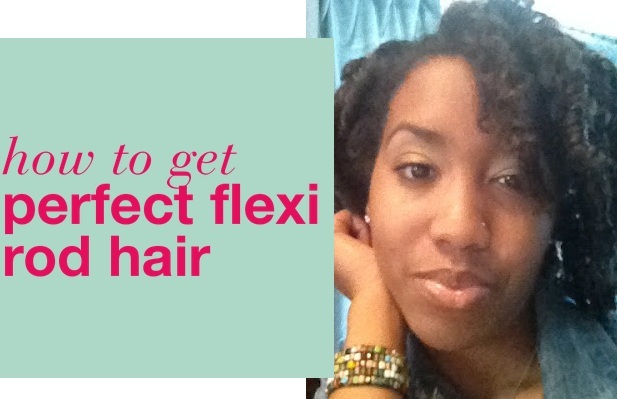 See, flexi-rods aren’t just for your mom and grandma anymore ... you can use them too!